'Holly Near: Singing for Our Lives' screens on Sunday, Oct. 7, at Cinearts Sequoia, 25 Throckmorton Ave., Mill Valley. 3pm. Near then performs in concert at Sweetwater Music Hall, 19 Corte Madera Ave., Mill Valley. 6:30pm. Visit mvff.com for details. CHANGING LIVES Holly Near’s values, musical and otherwise, continue to inspire with new film. After more than 50 years of art and activism, songwriter, social pioneer and longtime Sonoma County resident Holly Near is now the subject of a new feature-length documentary, Holly Near: Singing for Our Lives, that premieres on Oct. 7, followed by Near performing in concert as part of the Mill Valley Film Festival. Directed by veteran filmmaker Jim Brown, Singing for Our Lives details Near's career as a folk singer and her work as an advocate for peace and activist for social justice. "I had apparently more archival material than any artist he's worked with," says Near of Brown's film. "Little did I know what a hoarder I was, I guess." 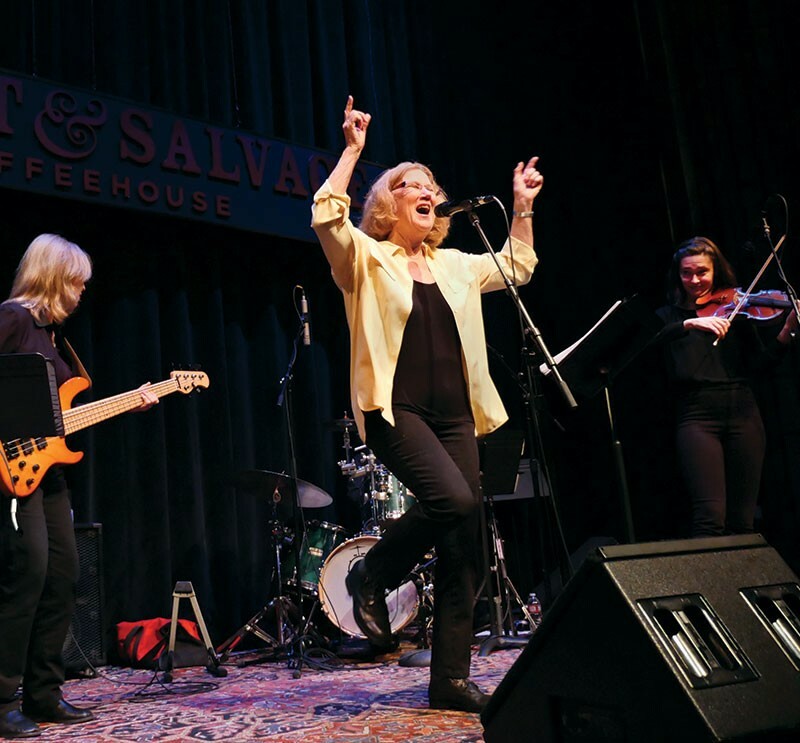 Singing for Our Lives is comprised of Near's collection of footage and recordings, interviews with contemporaries like Gloria Steinem and Jane Fonda, and a live concert filmed at Berkeley's Freight & Salvage. Throughout it all, Near's work in several social endeavors highlights her ability to inspire peace, justice, feminism and multicultural consciousness. "[Brown] did exactly what we all hoped he would do, and that was have people viewing the film understand a bigger context, that I was part of social-change movements, and they were part of me," Near says. Born in Ukiah in 1949, Near was heavily influenced by the Civil Rights movement of the 1960s, and her folk music quickly took on those values. Her life in music includes traveling with Fonda and Donald Sutherland on the Free the Army Tour in Vietnam in 1971, singing at events like the National March on Washington for Lesbian and Gay Rights in 1979 and being an outspoken proponent of feminist and women's movements up to this day. Earlier this year, Near spoke to several contemporary social issues ranging from domestic violence and flood destruction in Puerto Rico on her new album, 2018, featuring Tammy Hall on piano, Jan Martinelli on bass and Nina Gerber on guitar. "I'm very pleased with it," she says. "It's very direct, which seems like the right thing to do in these times." With the new documentary, Near has a chance to speak to a new generation of progressive-minded individuals. "This is an interesting time, and anybody who thinks what's going to happen in the next six months to two years isn't going to affect them is living in a dream world, regardless of your political party."